At the end of the gardening season last year I had many green tomatoes. I wrapped them in pieces of newspaper and stored them in a brown paper bag in my basement. I kept them in the dark and they not only ripened over the winter but stored very well. Here are a few of the last tomatoes that I just unwrapped today. They have been stored in the newspaper for 4 months. As you can see they look pretty good. Some of the skins are a bit wrinkled but these tomatoes tasted great in my green salad today. Wrap only about 2 green tomatoes in each piece of newspaper loosely. Place each wrapped newspaper bundle in a brown paper bag. 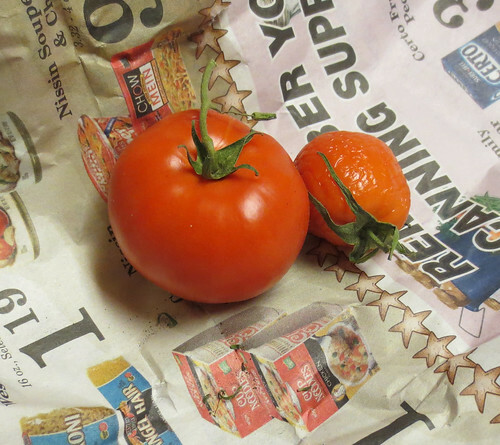 I was able to put quite a few bundles of wrapped tomatoes in the paper bag. Close the bag and keep it in the dark. Storing in the basement worked well for me. Check the tomatoes in a few weeks or as needed. Remove the red ripened tomatoes. Re-wrap the green tomatoes and put them back into the brown paper bag until ripe or when you need a tomato. Green tomatoes can be saved, stored, and ripened over the winter for future use.